At three hours and twenty-nine minutes long, this is a long council meeting. If you want to have a better understanding of what is going on, follow this link for a copy of the agenda, staff analysis and my commentary on the agenda. The opening prayer is offered by a Muslim scholar from The Islamic Center of Nashville. He is a guest of Councilman Burkley Allen. Following the prayer and pledge is a presentation recognizing Fisk Jubilee Day. Following that is the confirmation of appointees to boards and commissions and they all are approved as always.The mayor appoints members to boards and commissions subject to Council confirmation. The seat on the Health and Education Facilities Board is not a confirmation but an election with nomination from council members. There are two nominees to fill one seat. It is for a seat on the Health and Educational Facilities Board. The purpose of this board is to promote the health and higher education of the people of the Metropolitan Government. What they actually do, I don't know. Sometimes elections of this nature can expose factions within the Council and sometimes council members are heavily lobbied to support one of the candidates over the other. I have no insight as to whether are not the election to fill this seat reveals any thing about the council or not. If you want to see the nomination speeches and view the election go to timestamp 10:43 in the video. BILL NO. BL2016-350 would further curtail strip clubs by removing "adult entertainment" from two zoning classifications. It is deferred indefinitely. BILL NO. BL2016-379 would change the definition of a financial institution. Currently a metro ordinance defines a financial institution and part of that definition is that it is open to the public within hours that do not exceed 8:00 a.m. to 6:00 p.m. Monday to Friday, and 8:00 a.m. to 1:00 p.m. on Saturday. This bill change that definition by removing the restriction on operating hours and replaces it with a definition that says they must be “a state or federally chartered bank, savings and loan association, or credit union, a mortgage company, or other financial institution whose services are insured by an agency of the United States government.” That is an improvement. Under the current law a bank could not stay open till 3PM on Saturday or till 7PM on a Friday. The reason the city has a need to define them is to differentiate between respectable establishments like banks and places such as pay day lenders and check cashing services, so the city may restrict the deplorables and not the respectables. . In my view the city should not try to distinguish and instead let the market decide the mix and what and how many are needed. No one speaks on the bill and it passes. BILL NO. BL2016-414 in Councilman Scott Davis's district is a bill disapproved 7-0 by the Planning Commission. It would change from R6 to RM40-A zoning for various properties along Elvira Avenue, Maynor Avenue, and Keeling Avenue. This would allow 220 units of apartments to be build in a district that does not currently permit that. Quite a few people speak in opposition. Davis closes the pubic hearing and proposes substituting the bill by changing the the zoning from RM40-A to SP zoning which would still allow the development but impose additional restriction, and proposes the bill be referred back to the Planning Commission. Several council members express concern and say that the bill should come back to the Council for a new public hearing after the substitute is considered by the Planning Commission. After the discussion by council members, Davis says he will permit a second hearing after the PC considers the substitute. The substitute is passed by a roll call vote of 24 in favor and 18 against. The bill as substituted is then approved 28 to 10, rereferred to the Planning Commission and the public hearing is reopened. For those who are interested in understanding what is permitted under different zoning classifications, this link is a good resource. To view the discussion of this bill see timestamp 1:27:25-2:19:52. I am pleased with this outcome. Bills which are substantially changed, I think, should come back to the Council for a second pubic hearing. Also, I think the Council should take the recommendations of the Planning Commission very seriously. All resolutions are on the Consent Agenda. None of them are of much interest and they all pass. Bills on First reading pass by a single vote as is customary. BILL NO. BL2016-308 requires tenants of housing funded by the Barnes Trust Fund to comply with certain maintenance and conduct standards and to refrain from any illegal conduct on the premises of the dwelling being rented. Surprising me, this proves controversial. Several council members speak against it, mostly the African-American members of the Council. It is amended to say landlords "may" instead of "shall" enforce standards of conduct. This still does not satisfy some members of the Council. It passes on a voice vote with some audible "no's." To see the discussion see timestamp 2:27:02- 2:43:11. BILL NO. BL2016-336 says that if a local company is competing with a company that is not local for a metro contract and the local company submits a Matching Low Bid with the company that is not local, that preference be given to the local company. The staff analysis says that, "Historically, the Tennessee Supreme Court and Courts of Appeals have strongly disfavored local bidder preferences, citing the negative impact such preferences can have on competitive market forces," and that this bill may violate the Metro Charter and State law. This was on Second Reading last council meeting and deferred to this meeting. It is deferred indefinitely. BILL NO. BL2016-416 by Councilmen Mendes and Cooper would require that any Metro department or agency that must submit regular reports to the Metro Council should post those reports on their website and keep them posted for up to six months. There are 14 reports that must regularly be submitted to Council. This should be easy and cost nothing to accomplish. I support this move to make government more transparent and accessible to the public. It passes by voice vote. BILL NO. BL2016-417 would prohibit one from putting a "for sale" on their vehicle parked on residential property. I wonder how often this occurs and if this is really a problem. It is deferred "by rule." BILL NO. BL2016-418 would require Google to bear the cost of defending Metro in the lawsuit brought by Bell South against Nashville over the One-Touch-Make-Ready bill the Council passed last Council meeting. OTMR allows one company to climb a pole and move all of the cables that must be moved in order to accommodate a new party adding a cable to the pole. Google Fiber which is coming to Nashville ran into long delays in stinging their cable because each company that already had a cable on a pole had to move their cable before Google could add theirs. OTMR was passed to address this. ATT opposed this and said if the Council passed it, they would sue. The Council passed it; ATT sued. The staff analysis says that while there is no know prohibition against requiring a third party to reimburse the city for the cost of a lawsuit, there is no known legal precedent for requiring it. For background on OTMR and the controversy surrounding this issue see "BILL NO. BL2016-418" at this link. I would oppose this bill. The city should bear the cost of defending itself in court. It fails on a voice vote. To see the discussion see timestamp 2:45:38- 2:54:56. BILL NO. BL2016-419 would require Council members to receive diversity training. This is more useless unnecessary political correctness. Last Council meeting the Council passed a bill on Second Reading requiring the Council to receive Sexual Harassment training. Maybe this and that requirement could be combined and both included in some orientation. While they are at it they could throw in some sensitivity training and have a group hug-in. It passes on a voice vote without discussion. sell it to Cummings Station and it would permit metro to acquire a piece of land owned by Cummings Station. This parcel would be the eastern end of the bridge. 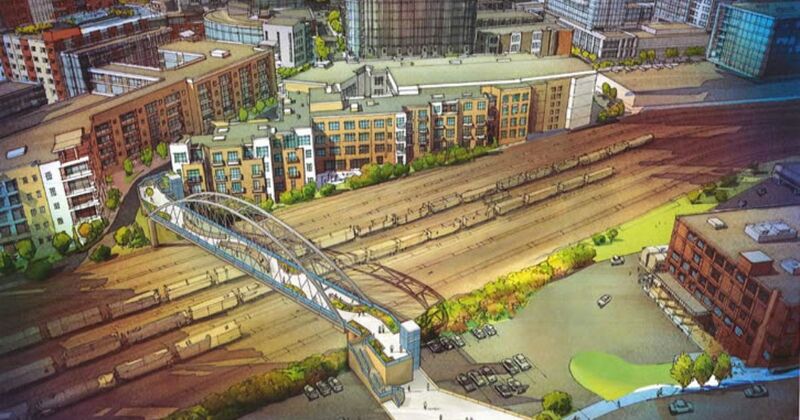 The gulch pedestrian bridge is already approved and funded. A couple of years ago this project was stopped by Council when council refused to approve a land acquisition ordinance necessary to facilitate the construction of the bridge. At that time the Council rebelled against the deal in frustration that so much money was being spend downtown and neighborhoods were being ignored. The project was funded then and is still funded. I support the pedestrian bridge. Certainly we could build a more utilitarian bridge for less or not build the bridge at all, but I believe this will be an important connection to tie the gulch to downtown. Also, I support the bridge as a beautification and an arts project. It will be one more thing to make Nashville a place tourist want to visit and a city where people want to live. Cities should not be just utilitarian but pleasant places to live and visit. The argument against if is that neighborhood streets need sidewalks and $16 million dollars would build a lot of sidewalks. This development is not, contrary to what I previously understood, being financed with Tax Increment Financing but is being funded from General Obligation Bonds, not that I think that is particularly significant. To see the discussion see timestamp 2:56:36 - 3:13:59. None of the Bills on Third Reading are of significance.